Barcelona is an incredible place. One of the main reasons why people from outside love this city is closely related to its soft Mediterranean climate. The warm sea, the bright sun and the nearness of the beaches make Barcelona a much coveted destination in summer. And while many beaches in and around Barcelona might get quite crowded in summer, there are still some places where you can calmly enjoy the Mediterranean. So if you come here, maybe staying at Coolrooms, you will have the opportunity to spend your time on the best beaches in Barcelona. For people who visit Barcelona for the first time the Barceloneta beach is probably be the first place they will head to enjoy the sea and the sun. However, the most likely thing to happen when you go there in summer is that the beach will be extremely crowded. If you want to find a place with less people without leaving Barcelona, you need to go a little bit further away from the city center. The Bogatell and Mar Bella beaches might be a great alternative in this case. Both can be easily reached by metro or by bus. As we are talking about city beaches, you will still find a considerable number of people relaxing there. However, there is clearly more space than in Barceloneta. Please note: a part of the Mar Bella beach is specially arranged for nudists. If you want to enjoy a place that is less crowded than that, you will have to go outside of Barcelona. The good news is that the Catalan metropolis is surrounded by a whole bunch of lovely little towns directly on the seashore. One of them is Ocata. It is located only half an hour away from Barcelona. All you have to do to go there is take the R1 local train form the Plaça Catalunya. It is a flat pristine beach with golden white sand. The Ocata beach is considered as one of the best in the Barcelona metropolitan area. It is also a great place to relax with your kids. The Castelldefels beach is yet another great place on the seashore that is pretty close to Barcelona. With its dreamy, spacious stretches of sand this beach makes you think about how great it would be to move beside the sea, buy a dog, and spend every evening strolling by the water. 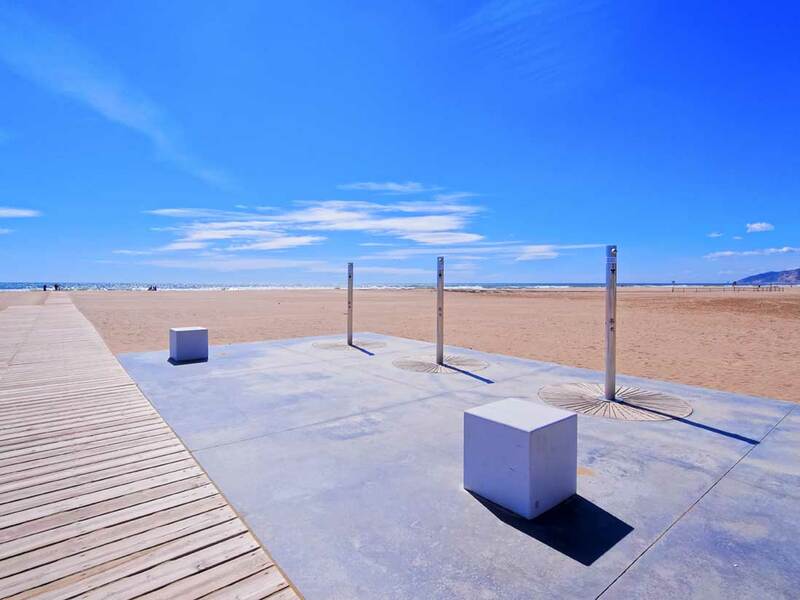 Of course, in summer the Castelldefels beach also fills with locals and tourists. However, it is quite big, and so you actually never have the feeling that it fills up completely. The train ride from Barcelona will take you less than half an hour. This means that you can easily plan your day, enjoying Barcelona in the morning and going to Castelldefels in the afternoon (or vice versa).